Exhibited for "Power Print: Woodblock Prints by Ram Kumar Panday" at the Asian American Arts Centre, New York City, July 13-Aug. 3, 2001. 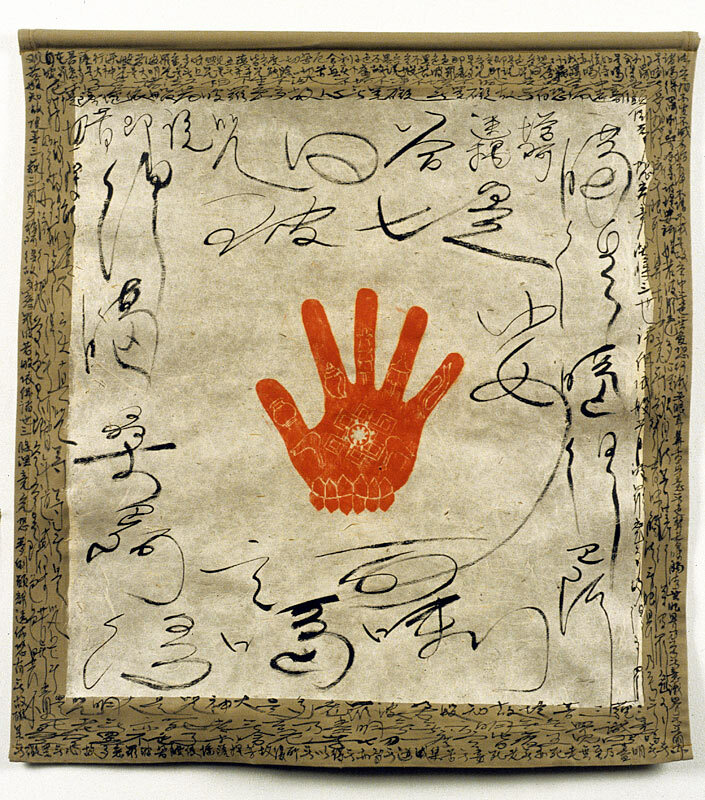 "Human hand is very powerful, and the auspicious symbol of well being. In the center there is a wheel of 8-fold path to enlightenment inside Shrivtsa, the endless knot. The base of the hand has padma lotus -- symbol of purity and beauty. - The thumb and fingers contain the kalasa vase -- spiritual wealth. A Sanskrit prayer says that the goddess of wealth, wisdom and Govinda the power of the god all are in hand. So one should salute one's hand early in the morning.